How to Plan your Trip to Alpather Lake? 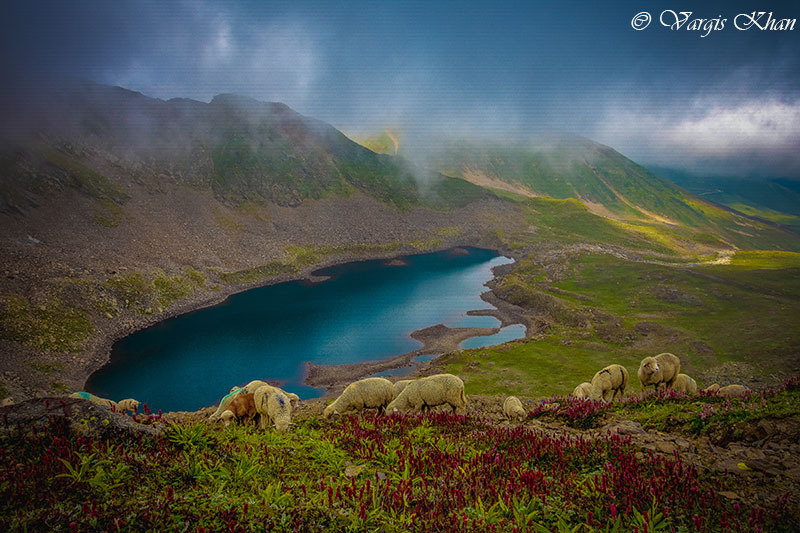 Alpather lake is a picturesque small lake at the foot of the twin Apharwat Peaks; at a height of 4,390 meters. Also known as “Frozen Lake” by the locals, it is one of the major tourist attractions in the small town of Gulmarg. Surrounded by rocky mountains and lush green meadows that are covered with beautiful wildflowers, this lake is beyond any doubt a sight to behold. It is not just the lake to be honest, but the entire journey that you will take to finally get here, that is an experience in itself. And when you finally get to stand on the banks of a stunningly beautiful lake in the middle of nowhere; at the top of the highest peak around; you know that you are going to be talking about this trip for days to come. In this article, I will discuss some tips and details on how you can visit Alpather Lake in a single day from Gulmarg. If, after reading the article, you have any other questions, you may comment and ask towards the bottom of this page. During the months of winter, in January and February specially, this entire lake freezes completely. So much that you could easily walk over it. It starts to melt in March but has chunks of ice floating in it and remains surrounded by plenty of snow well into the month of May. Due to this very fact, the locals in Gulmarg refer to this water body as “Frozen Lake”. Even I was thrown off by this mention initially; and thought that they were in fact talking about a different lake altogether. Let me first start by covering a bit on where exactly the lake is located for a better understanding of how to get here. It sits at the top of a mountain, Apharwat Peak, in almost like a bowl shaped formation in the small tourist town of Gulmarg. The total distance between Gulmarg and Alpather Lake is 13 kilometers and it is connected to the town by three ways; a trek, cable car and motorable road. Yes, you read that right. There is in fact a motorable road that goes right from Gulmarg to all the way to the top of Apharwat peak; and runs right next to the lake. You however cannot drive on this road and will either have to trek or catch a Gondola ride. How to reach Alpather Lake? The first part of visiting the lake would of course be to get to Gulmarg. You will first have to get to Srinagar and from there, reach Gulmarg. Please read How to Plan a Trip to Gulmarg for further details on this part of the journey. Once you reach Gulmarg, you can then reach Alpather Lake by either of the three ways I suggested above. Now since we were just talking about a road, so let me first cover that. lso Read: How to Plan your Journey on Mughal Road? When you stand at the top of Apharwat peak, you are just way too close to LOC and can even see Pakistan administered Kashmir. There is in fact also an army post at the top of the mountain. And then further ahead are some small villages and more army posts along the border. So the road from Gulmarg to Apharwat peak and the lake was actually built by Indian Army and gets used only by their vehicles. Civilians are not allowed to travel on this road and you will be stopped at the check post the moment you start driving up. On a different note, the road is way too steep and way too bad. It is only doable by 4×4 vehicles. Any other car, even a 2×4 SUV, will not be able to make it out here. Even if you were allowed to travel, you will still need a strong car with great ground clearance, excellent driving skills and nerves of steel to make it to the top. This of curse is for the adventurous type; people who are fit enough and are into trekking. Why do I say that? Because the trek is of 14 kilometers of steep climb on a rocky terrain. I walked only the last 3 kilometers of it and it left me exhausted completely. So much that I had no energy left to trek back; the distance and hoped into an Army truck for our journey back to the Gondola station. So if you have done some trekking, have good enough stemina then yes, you can try trekking to Alpather lake. If you are gonna do that, there are 3 things that you must keep in mind. First is that you will need a local guide which are available in plenty in Gulmarg. You cannot do this trek on your own. You will end up getting lost which considering that it is a sensitive area close to the border is not really a good idea. Second thing is that you must start early from Gulmarg, possible by 5 AM or first light of the day. This is not an easy trek and will definitely take you some time to complete. So in order to be back before dark, start early. Third is that there are no eateries on the way so ensure that you are carrying water, some biscuits or snacks along. The best way to get to Alpather Lake from Gulmarg is by Gondola. I am calling this the best way because it offers you a little bit of almost everything. You get to catch a Gondola ride which is a great experience in itself. Then you get to do so me trekking a well to add to your adventure tale. And then finally you will be standing at the banks of Alpather Lake without stressing yourself too much. So how do you reach at the lake by Gondola? It’s quite easy really. From Gulmarg, catch a Gondola ride for Phase 2 which will cost you about Rs. 1,600 per person. When you get down at the Gondola station, come out and start walking towards your right. It can look a bit confusing because there is no clear trail; just a bunch of huge rocks. But towards your right is the top of the Apharwat peak so just start climbing up towards the top and you will eventually get to see the lake after about 3 kilometers. It is a bit hard to explain the trek in words. Take a look at this post in the community forum; Alpather Lake Trek Pictures. In this post, I have explained the entire trek in pictures, step by step, which will make it easier for you to understand. If you want to see the trek but don’t think you can make it on foot, then another way would be to catch a pony ride. You can sit on the pony and ride it all the way to the top of the mountain and then to the lake. Do remember though that this can be a bit too scary for some people as the pony starts to climb up. Another thing is that this will also be expensive. It will cost you even more than the Gondola ride. Also Read: How to Plan a Journey to Aharbal? Well by road you cannot definitely go so that is out of the picture. If you were planning to trek the entire 14 kilometers from Gulmarg then it will easily take you about 12 to 14 hours at least; depending on your physical stamina. If you were going by Gondola however then it will take you about 2 to 3 hours from Gondola station to go to the lake and come back. Either ways, it is at least a day’s affair from Gulmarg. Can you Camp at Alpather Lake? Absolutely not. There are no hotels or camp sites nearby and you cannot even camp on your own. As I mentioned, this area is way too sensitive and you will be in trouble if Army caught you camping here. You may even be assumed as a possible terrorist and get shot at in the dark of the night. Do not attempt to camp up here. Make it a day’s trip and go back to Gulmarg. Also Read: How to Plan a Trip to Doodhpathri? In few simple words, you don’t need one. The only time you may need a local guide is if you were trekking in the months of January, February or even March; to help you navigate your way through all the snow. For rest of the months, you don’t really need a guide. The lake is very easy to reach from the Gondola station, all that you need to do is climb up towards the top of the peak. The entire town of Gulmarg is swarming with guides. These guys will lie between their teeth and try to make a fool out of you. They will tell you that the trek is difficult and only they can show you the way. I understand that they are poor people and competition is tough. I wouldn’t even mind giving small amount to help but the problem is that they don’t ask for small. The usual charge is Rs. 1,200. A guide at top of the Gondola station asked me for Rs. 2,500 to show the way to the lake which I ended up finding on my own. There is no way that I am paying that kind of money let let someone walk with me. So unless you went visiting in winter, you don’t need a guide and should save yourself some money. All times are best time to visit the lake to be honest. It presents a different color in every season. The picture posted above was taken in August when the entire area was lush green after monsoon. Let me give you a breakdown of how the lake looks in each month. Alpather Lake in January – Covered in snow and completely frozen. Extremely cold with snow all around. Must wear war woolens and a heavy windproof jacket and come with a guide. Alpather Lake in February – Same deal as the month January. Alpather Lake in March – Same as previous two months. The only difference is that the snow starts to melt around this time. Alpather Lake in April – Spring arrives. Lush green all around with some snow still left. One of the best times to trek to Alpather Lake. Alpather Lake in May – Lake would have melted completely. There will be some snow left on the hills around though. Alpather Lake in June – No snow. A complete blue water body. Plenty of chances of sudden rainfall. Alpather Lake in August – Lush green all around and a sight to behold. Another great time to trek here. Alpather Lake in October – Winter will start to settle in and it can snow here anytime. Alpather Lake in November – The lake would start to freeze and there will be occasional snowfall in the region. Alpather Lake in December – The entire area will start to turn white and lake would be partially frozen. And I think that pretty much covers all that you need to know about trekking to Alpather Lake. I hope the information above was of help. Please do take a look at the Forum Thread to understand the trek route better visually. If you have any other questions; please feel free to ask in the comments section below; or at our Community Forum; and I will be glad to answer. Can we trek from the gondola station to the lake in march second week or so? You can but hire a guide in winter season please. There will be a lot of snow up there which will make the trek difficult to navigate and walk. Hi, is it possible to walk to the alpather lake from the gondola at this time of the year? You can try but go with a guide only. There is too much of snow in Gulmarg right now, don’t try the trek on your won.